If the center of the human brain, consciousness cortex part due to the "seven emotions"long-term over-stimulation of the vicious signal, thinking activities, in contradiction, thinking cortex strain, causing chaos complicated functions, is bound to lose balance adjustment capability. Because people's emotional, mental day restless, worried, nervous, depressed, fear, greed, hatred, over time, the brain is bound to the central nervous function disorders of symptoms. There people have meridian, meridian on the meaning of human illness is beyond doubt. Its function mainly by three aspects: First, "the line blood, yin and yang transfer; the second is reflected in the window after the illness, against the Evils of the channel, the three are connected to internal and external environment, communicate the size of the universe. Qigong healing is inseparable from the meridians, acupuncture qigong healing and similar treatment of the meridian theory. 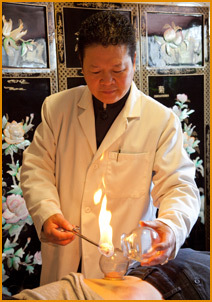 Qigong master issued a "gas " Why can cure disease? Mainly because, first, there is commonality between people, the message code have in common, "external qi"effect will be produced after the "synchronous resonance, "which is the basis for treatment. Second, people have got between the corresponding parts of running, gas exchange, which is the kernel of treatment; third Everybody needs of nature, "Qi " to fully support the gas, which is the energy of human life activities Sources, but also "external qi" treatment of the material basis. Motherland medicine referred to as "outside of all the inevitable, " the body's disease is always certain forms, or to a different complexion, tongue color, shape changes, or unusual odor, or through the meridian system performance On the surface. Meridians and acupuncture points are reflected in the window channel and the internal organs of disease, so when we point - Meridian - organs in health and life energy flow messages - "gas ", it will be because of "the gas to the disease"and to play Pass Cure the disease by promoting blood circulation, and this is the "medical treatment from outside the" base management.